In Gospel Amnesia, I discuss one of my biggest idols: the desire to be a godly parent. I know it may sound paradoxical. After all, which Christian parent doesn’t want to be a “godly parent.” And besides, aren’t we commanded in the Scriptures to be godly parents? First, anything can be an idol. Second, we are not commanded to be godly parents. We are commanded to love the Lord our God with all our heart, mind, and strength and to teach this love of God to our children (Deut. 6:4–9). That is a huge philosophical shift from “be a godly parent.” These are two different religions! The first is Jesus’ direct command and has as its object God. We are to point our hearts to God and to teach our children how to point their hearts to God. The second has as its object ourselves and our children, seasoned with the adjective, “godly.” The object becomes how to rightly be a parent with the drive behind it as the welfare of our children, spiritual and otherwise. I spent years and years reading books and blog posts on how to be a more godly mom and parent. I can’t do it anymore. As a matter of fact, I had no intention of buying one more book on motherhood. The inspired Word of God which I open up every single day has been telling me for years what I need to do: Love Jesus and love my neighbor (hint: my family are my closest neighbors). The issue is: Will my heart obey these commands from the Lord himself? Take no heavier lift of your children, than your Lord alloweth; give them room beside your heart, but not in the yolk of your heart, where Christ should be; for then they are your idols, not your bairns. The questions I ought to be asking are these: How does believing in Jesus change the way I face the monotonous daily grind? Or how does believing take an interrupted nap in stride? How does faith in God rescue me from a restless heart? How can I experience the peace of Christ when I am so prone to failure because of my sin? How does the gospel make me into a woman who rests in the peace of God in the midst of the chaos in my heart? Would you define Glimpses of Grace as a "how to be a better mom" book? If not, why not? I'm so glad you asked this question! Glimpses of Grace is decidedly not a book focused on motherhood. It’s about treasuring the gospel in your home, a subject that is applicable to women regardless of whether they have children. I address this book to women who need to take refuge in the Lord and taste and see that he is good, which would include all of us! On the subject of motherhood and the gospel, I’ve written Treasuring Christ When Your Hands Are Full: Gospel Meditations for Busy Moms (Crossway, 2014). We do well to seek advice. This is wisdom. But there something to being at your wit’s end that begs for more than instruction. Psalm 107 illustrates a season in the storm. Men in ships doing business on great waters are literally struck by a tempest. Scripture says, ‘They reeled and staggered like drunken men and were at their wits’ end’ (v. 27). Their response to being completely helpless was to cry out to the Lord. No how-tos, no cute preservers, but just an honest and urgent plea to be delivered from a situation that was more than they could navigate. What did the Lord do on their behalf? He showed them his steadfast love. He calmed the waters, hushed the seas, and brought them to their desired haven. This is sustaining grace, this is the desired haven: to know his steadfast love that saves and keeps us. Glimpses of Grace is not a how-to. It is a true friend’s invitations to see and know the Lord’s steadfast love displayed in every wave, big and small. Indeed, there is a need for how-to, time-tested wisdom regarding keeping a home. But Glimpses of Grace does not address the need for table setting skills (incidentally, a skill in which I am sorely deficient). Glimpses of Grace describes how God, in his word, lays out a spread for us that addresses our heart’s deepest, most comprehensive need—to learn to feast on Jesus, the Bread of Life. What were the circumstances and the heart issues that drove you to write this book? For far too long the mundane loomed larger than eternal life for me. I wrote this book because I wanted to remind myself (and others) that every mundane moment of the day contains the potential to plunge our hearts into worship of the Living God whose matchless kindness leads us to repentance. For far too long I’d bought the lie that “this, too, shall pass” was the hope that I needed to cling to. The hope that I need to cling to is that God’s faithfulness will never pass, and because of the person and work of Jesus Christ, I am constantly running headlong into his future grace. Learning to cherish the gospel became key for me in beginning to understand this, and living in my home is the primary place I need to work out these heart-anchoring truths. Why should pastors encourage the women in their church to read your book? 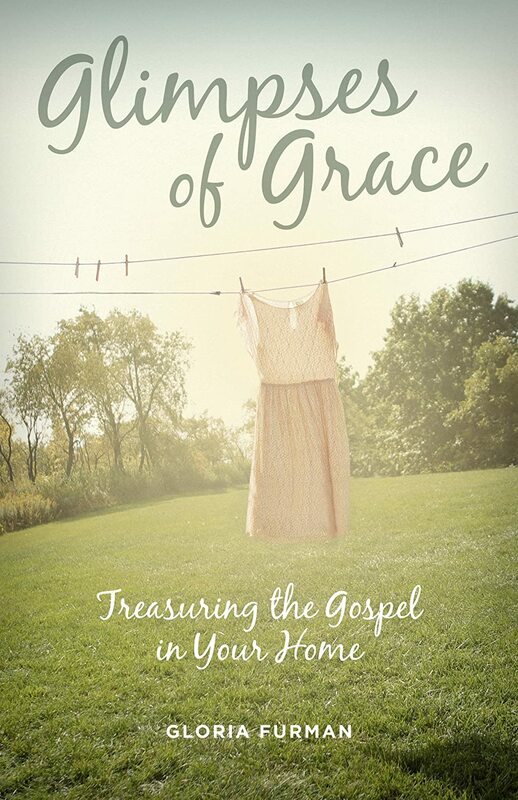 Although how-to manuals for homemaking are vignettes of wisdom and experience worth sharing, Glimpses of Grace is about something else. It’s a reflection on the glorious gospel of Jesus Christ. Pastors want the women in their church to be rooted and grounded in Christ’s love, which is the same prayer that I have for the women who read this book. My goal in writing this book is that it would serve as a creative and repetitive reminder of the good news, pointing women to worship our Savior in the midst of their lives in the home. I'm grateful for Gloria's friendship. Many times as I've discussed struggles with her she has helped me turn my gaze away from the situation to see Christ above it all and to grasp how the gospel applies to my heart issues in that moment. In my discipleship relationships right now, I say this to the women I have handed this book to: It's a book that shows you who Jesus is and how much he loves you. You don't need a book that tries to tell you how to be a better mother. If you want to be a better mother, or a better anything, look to Jesus and cling to him and refuse to let go. Whatever the “this” that you desperately feel you can't do anymore is ultimately not about your circumstances. It's about peace with God. And God has provided a way for you to have that peace that dominates any and all circumstances, regardless of how difficult they are. God is using this book to bring a peace between me and him about many things I have been saying “I can't do anymore.” Including reading this type of book. Luma Simms (@lumasimms) is a wife and mother of five delightful children between the ages of 1 and 18. She studied physics and law before Christ led her to become a writer, blogger, and Bible study teacher. She is the author of Gospel Amnesia: Forgetting the Goodness of the News. She blogs regularly at Gospel Grace.